Breast density – what are the risks? What does the term “Dense Breasts” mean? Breast density refers to the composition of the breast. All breasts contain milk glands, milk ducts, fibrous tissue (all of which constitute “dense” tissue) and fatty tissue (non-dense). A higher ratio of glandular/fibrous tissue to fatty tissue is normal in young women and is the reason why mammogram is usually not performed in this age group. The term dense breast is usually reserved for the 40% of women age 40 and over have who still have high amount of glandular/fibrous tissue seen on mammogram. How is breast density detected and categorised? Breast density is determined through a woman’s mammogram and described as one of four categories: (A) Fatty; (B) Scattered fibroglandular density; (C) Heterogeneously dense; or (D) Extremely dense. Breasts which are (C) Heterogeneously dense; or (D) Extremely dense are considered “dense breasts. What are the screening and risk implications of dense tissue? Mammograms are effective in detecting cancer in most breasts as the x-rays can ‘see’ through the tissue. The X-ray dose is very low and the risks of extra radiation are extremely small. However, dense breast tissue and cancer both display similarly on a mammogram and some cancers can be masked. As seen in the adjacent images, dense breast tissue appears white on the image as does a cancer tumour; it is like looking for a ball of cotton in a snowstorm. 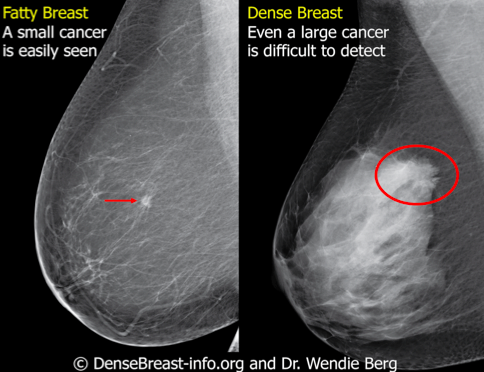 This does not mean that if you have dense breasts it is not possible to pick up a cancer but as density increases, the mammogram’s sensitivity decreases. Dense breasts over 40 years of age are also linked to increased breast cancer risk. Reasonable estimates put women with the densest breasts at 4-6 more times more likely to develop breast cancer than women with the least dense breasts. The likely reasons for this are that higher breast density is also linked to higher oestrogen levels over a longer period of time or may be associated with chronic tissue inflammation – although more research is need in the field. How would you know if you have dense breast on Mammogram? What can be done to improve image accuracy in women with dense breasts? Many argue this would cause un-necessary stress but others would say it would give the women more incentive to change their lifestyle to reduce their cancer risk. Organisations such as the awareness group Breast Density Matters argue that it would give women a chance to pay for additional screening tests, such as ultrasound or MRI as these when added to mammography, increase the detection of early stage breast cancer in women with dense breasts. McCormack VA, dos Santos Silva I. Breast density and parenchymal patterns as markers of breast cancer risk: a meta-analysis. Cancer Epidemiol Biomarkers Prev. 2006;15(6):1159-69.